If you're stuck for ideas on where to host your Christmas party this year, why not indulge in a little touch of class, courtesy of Darren Bennett and Lilia Kopylova? On Saturday 8th December, in the unique setting of The National Railway Museum, York, guests will be treated to an evening of dance by none other than the aforementioned ballroom dancing champions, all the way from the set of BBC1's Strictly Come Dancing. The National Railway Museum may seem like an obscure venue to stage such an event, but when the doors are closed to the public at 6pm, this historical building truly comes alive. Come Dancing Christmas will take place in the museum's Station Hall, famed for Queen Victoria's Royal Carriage and other locomotive relics, which provide a warm and comforting setting in which to dine and be entertained. Gone is the hustle and bustle of the daytime visitors, and instead come the luxuriously-decorated evening table settings and staging areas, with just a touch of festive sparkle thrown in. Guests can indulge in a Christmas-themed 3-course meal while sat between the Royal Platforms, and peruse at their leisure the history behind York's thriving railway industry. Seasoned ballroom-dancing fans can sit back and relax while the museum's onsite catering team Milburns provides a luxurious meal and silver service, while being treated to four spectacular dance routines. Those who want something a little more up close and personal can even book limited premium seating to really make the most of this one-night-only experience. What's more, following the evening's entertainment, there will also be an opportunity for audience interaction as well as a 'Q and A' session with Darren Bennett and Lilia Kopylova themselves. If you're looking for a particular brand of Christmas sparkle this year, you'll find no better event than Come Dancing Christmas. The National Railway Museum's unique ambience and world-class service make for a truly memorable event, and this once-in-a-lifetime opportunity to view two first class dancers in the flesh is not one to be missed. 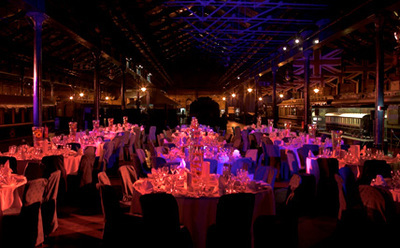 Whether it's a corporate event or just an evening out with your partner, you'll find everything you need in the warm and accommodating setting of the National Railway museum. Tickets are selling out fast for this unique event, so book now to enjoy an evening perfect for dinner and dance fans alike. For more information on pricing and menus, click here. Hi Katie. Great article about a night at the museum which will I'm sure will be more exciting than the movie, viz, a Night at the Museum especially if one is into dancing and train spotting or train hugging (whatever the apt expression!). I hope you don't mind but I have sent to Link to some friends in Leeds as I used to work in Leeds as a lawyer in 2002-2003 and visited the wonderful NRM and of course fantastic York where I also played music on occassions. I have recently started writing a couple articles for Week End Notes in Brisbane. Best regards, Julian Wagner (Brisbane). That's absolutely fine- I'm only too happy to promote my articles! Glad you had a good time in York; I went to university there and don't have the heart to leave! Thanks for reading; I'll have a little peek at your articles too now- must make my way over to Australia at some point!